This was an especially doodle-heavy month for my bullet journal! From my habit tracker to a doodle challenge, from tiny book drawings to a travel diary - there were just so many occasions that I wanted to capture in pictures rather than words. The bullet journal really is a wonderful tool to capture ideas and preserve memories. It hasn't even been a month, and already I love looking back at some of my notes - and remember events I'd otherwise have forgotten. So here we go, a look at all my Bujo pages for June! Let's be honest: This isn't a "day" of work. The nature of illustration commissions makes them a long process spanning days or weeks, from sketches to last corrections. But: This would be an ideal day in the life of an illustrator, aka my ideal work day! I'll guide you through the entire process of creating a custom, personalized illustration - from idea to finished piece. This post contains affiliate links. I only recommend products I purchased myself, use and love. For my full affiliate policy, please visit my 'Disclaimer' page. I recommend mostly art materials I've been using for years! I'd started drawing blog banners nearly two years ago, just after I'd gone from working for a comic publishing company to freelancing. My first 'Beauty' illustrations were just little sketches of my own favorite makeup products, but those quickly evolved into more elaborate motives, #motd drawings, and my very first sticker motives. Instagram really helped in getting the whole beauty and makeup illustration angle going. 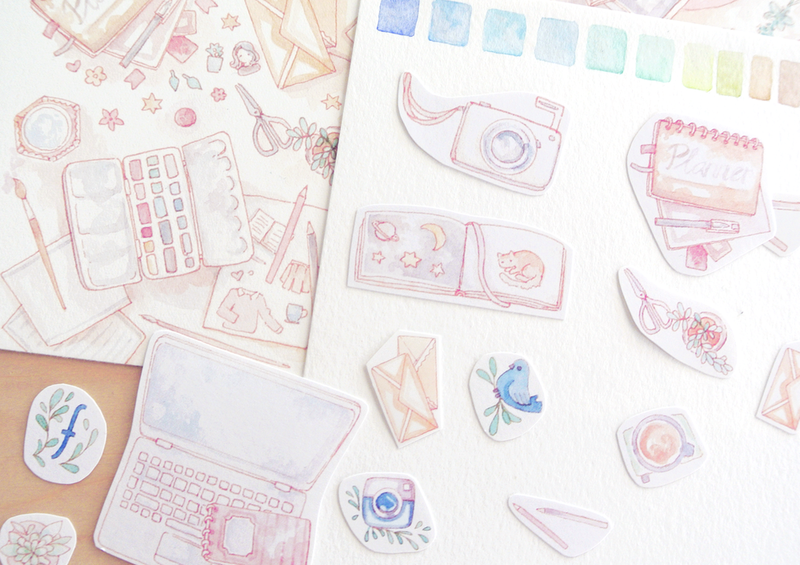 For more tutorials, here's how I paint watercolor stickers! A guide to cleaning up small watercolor art digitally in Photoshop. My Freelancing Journey so far, from art school to self-employment. From sticker motives, I went on to draw product illustrations for online shops and beauty brands... and then the first few blog header illustrations. Beauty Blog Header Illustrations are to this day some of my favorite commissions! The old header illustration - kept quite simple and with toned-down, cool colors. The new blog banner is warm-toned, brighter and more whimsical. So when Sooyoona from Something Beautiful requested a new version of her previous blog banner, I was excited to both draw the piece and look at how my art style had changed in the meantime. The commissioner/blogger/brand and so on provides a list of products, color schemes, random favorite decor elements (like flowers, patterns, stationery...) and an overview of their brand's style guide. Ideas can evolve from that, or from and image the client already has in their head. I personally really like the look of flatlay illustrations - as in, drawings that mimic flatlay photography. But I've also drawn desktop arrangements, cute shelving and floral pieces for blog headers. Depending on the blogger or brand, one theme might be more fitting than another. Based on those initial ideas, I then draw a couple of sketches to test different layouts, arrangements, and formats. Sometimes, a logo has to be included, either hand-drawn or as a typography element. For these banner commissions, I use a certain type of paper and pencils to make sure that later on, when the image is scanned and used digitally, everything looks smooth and clean. While watercolors can be really fun on textured, rough paper, those papers usually don't scan well. Most watercolor papers also have a cream or even yellow-ish hue to them, which makes color adjustments a bit of a pain. Since these illustrations are specifically made for digital presentation, I focus on materials that look better digital than when looking at them in real life. A "What's in my Pouch?" Beauty Illustration for Shiaswelt. Love the pink pastel hues here! My paper of choice for the last five years (I've previously used it for comic book cover illustrations) is the Fabriano Artistico Watercolor Paper in Hot Press Extra White. It's so smooth that you can even use ink nib pens without the paper fibers clogging the nib, and the lack of texture makes scanning very easy. The Extra White color is a bonus for anyone who wants to use their watercolor illustrations digitally later on, with the white paper background easily used for color balancing. For commission pieces, I also prefer a very hard AND a soft pencil, both applied with soft pressure. Why two kinds of pencils? A 2B or 3B pencil, used with soft pressure, leaves the paper undamaged and is easy to erase. This is perfect for sketching before then drawing the lines with a waterproof pen. A 3H or 4H pencil, again, used with soft pressure, for the parts of the drawing that won't be lined with a pen or ink later on. Since I won't erase these lines before using watercolors, the hardness of the pencil prevents 'stray' pigments or pencil dust that might mix with the water and leave nasty streaks or stains, and the light color of harder pencils also looks pretty much invisible after coloring on top of them. On the image above you can see the pencil lines drawn with a 3H pencil (this one by Faber Castell) for the center piece of the illustration, which won't receive any pen outlines. The green plant elements around it are already colored in and the pencil lines there just leave a hint of definition. The elements I'd previously sketched with a 3B pencil (I absolutely love this 'School Line' 3B pencil by Caran d'Ache ever since I discovered it while applying for art school!) are now drawn with a sepia multiliner by Micron. The soft pencil erased easily, and the Fabriano paper does well with even more heavy-duty eraser rubbing. I use a Tombow MONO eraser for actually erasing pencil lines. If you've never tried MONO, you're missing out. These are magical, and I've gone through about a dozen while working on comics and illustrations for the last couple years. For just toning down lines or removing graphite dust pigments, I prefer a kneadable eraser by Faber Castell. Before going into too much detail for any part of the illustration, I try to get a grasp of the overall color scheme. While the brand's or blogger's colors have been discussed previously, there are still a lot of tiny color differences and shading decisions that I make on the go. I was using both my Windsor & Newton watercolor set from anno ... 1995 or something, and my brand new Shinhan watercolors. The Shinhan colors are brighter, mostly as a result of the Windsor and Newton ones slowly aging and me carelessly mixing colors in the pans, which gives a bit muddier results. The Shinhan tubes are also really cheap, so I'd recommend getting a set of these when you're just starting out with watercolor painting or if you're looking to expand your collection of shades. Once the whole illustration has been covered with a first layer of color and I know where I want to go with the contrasts, where I want to put the most saturation and therefore focus, the details are allowed to join the fun! The first one is self-explanatory. Adding light reflections, detailed shading and coloring in even the tiniest parts of a drawing automatically makes the result more detailed, playful and intricate. The second technique adds visual interests to otherwise simple parts of a painting. I used watercolor patterns and textures on the book covers, the cup and the pouch, as well as all over the background. But adding in tiny watercolor 'splashes' that look random but are carefully placed all over the illustration keeps the end-result from looking too clean. A chaotic desk illustration with lots of beauty, makeup and stationery products! This one was on the realistic end of my blog illustration spectrum and I loved the more detailed shading and three-dimensional view. I don't actually splash around with watercolor. While I love playing with wet-on-wet techniques and random effects in my sketchbook, I really, reallllly don't want to ruin a commission piece! Random effects are fun, but well, they're random and can go very wrong. So my watercolor textures are carefully placed and I don't use too much water - that way, I have more control. The center element without pen outlines and, instead, lots of plant elements. The color scheme for this part of the image is actually quite different from the rest of the image, making it its own entity while still fitting in with the overall image. I used warm greens, mixed with beige for the desktop illustration, but colder greens mixed with blue and white for the logo part. White isn't traditionally a part of a watercolor set. But Shinhan has a white pigment tube in their set, and I love adding it to illustrations. It tones down colors, making them milkier. Ultramarine blue on its own, for example, is a dark blue but very 'see-through'. Mixed with white pigment, it becomes slightly lighter, like a pastel version of the previous color, and loses the see-through quality - so you can paint over mistakes, pencil lines, or add more plasticity! I used only Ultramarine blue mixed with different quantities of white for all blue parts of the center logo. The rest of the illustration doesn't have much if any white mixed in, so the colors are 'purer' and warmer. After the illustration was finished, I scanned it with my Epson Perfection V330 Photo scanner (Epson has some of the best scanners for color accuracy among all those I've tried so far - while staying affordable) and adjusted exposure, levels, and contrast in Photoshop. The original piece I mounted on cardboard for a cleaner look and more stability. You can see the finished, digital version over on Sooyoona's blog "Something Beautiful". That's it for my painting process of commission pieces. Of course, each custom illustration requires a different approach, depending on the style, color scheme, and subject, but the overall work process remains similar. If you'd like to commission an illustration, contact me at parkevelyne@gmail.com with your ideas, or head over to my Etsy shop! You can always use the contact form, too. If you're an artist - beginner or advanced - then my art advice on two ways for improving drawing skills can be found here!